Johnson babies: "You've got your hands full"
We did plan our pregnancy, maybe we didn't plan to get pregnant so quickly but there you go. As the boys were also a month early our 22 month age gap was "planned but not intentional". When people comment on us having our hands full I do still wonder how many parents with two singletons receive the same comment, constantly. I have discovered it's an eye contact thing though, head down or eyes focused forward generally ensures we get done quicker, but I'm a sucker for older people, who generally seem more heartfelt in their conversation. 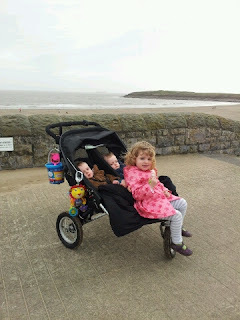 The Out 'n' About nipper: we looked at a lot of buggies and prams, but having decided we weren't going to opt for a triple we needed one which could have a buggy board. We decided on the Nipper because it seemed the most economical, it was light enough to allow three to be on board, especially as they all grow up. What we discovered about the Nipper was that Seren at 22mths didn't like the buggyboard, and although it is not advertised as such, the foot board on the front has served well as a resting place for Seren when her feet can take no more. In the early days the most difficult thing was to keep Seren entertained when the babies were a constant stream of feeds, nappies and naps. Our approach was to take the mornings as easily as we could, Seren loved baths so she would have a long bath in the morning and either the babies would go in one at a time or I would see to them so we were all ready to go downstairs... by about noon! The most important thing was to be prepared, not only for the babies but also with their feeds taking close to an hour make sure Seren would have enough to keep her entertained- books, colouring in, snacks, tv was the general order of the time. I would try and make the afternoon as focused on Seren as possible, in the early days this involved trips to the local Childrens Centre for activities, I did find this difficult as they were scheduled and it anything went awry we would miss the opportunity, so we started using the local park, play centres and Eureka! 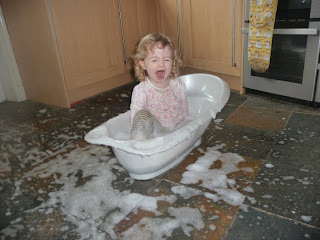 when this seemed too much we would do things around the house, messy play in the kitchen, craft kits from Tesco were a real hit, and when the weather was good the paddling pool came out. When it comes to toys and playtime I have felt guilty of late that Seren doesn't have so much of her own, she had lots of Happyland things before the boys arrived, and since she has had a kitchen and more recently a dolls house. I think this is plenty. As we have not done the 'two of everything' toy wise we have so many toys. My logic here is that they argue over toys whether they are the same of different, the rule seems to be "if you have it, I want it", so we just have lots of different distractions. Seren is more attached now to the toys she had as a baby than she ever was as a baby. The one thing we do here is rotate, we have a couple of baskets in the lounge that get swapped with those in the playroom so their attention is focused on playtime as much as it can be. In the evenings Seren would go to her Nanna's whilst Tony went to squash. 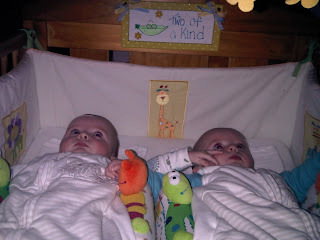 This gave me the time and focus to get the boys sorted for bed, and to begin the routine of getting everything sorted- sterilising bottles, preparing clothes and the changing bag for the following days. We also discovered the benefit of meal planning at this stage, Tony would make our meal when getting home from work so to make sure we were getting enough variety but also do be able to keep meals back the meal planner become a feature of the fridge, it also helped with budgeting on statutory maternity pay. The one thing which we did with the boys which made life easier then, and continues to now, if from about 4 weeks we put them in their cot every night at 7 and they did not come out of their cot until 9am. With Seren I could not have imagined attempting this, I can't imagine I would have had the will power. 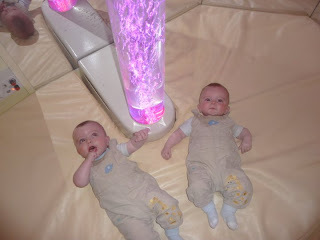 With the boys it was a mix of appreciating the necessity and acknowledging that they soothed each other. They have gone to bed at 7pm every night since, it is one of the few things I consider an achievement, and it is the thing that has made our lives a tiny bit easier. They do have disturbed nights but generally are good sleepers, we get them up at 8 now as Seren has pre-school most mornings, but I do think our determination on this has served us well. (This is a definite boast, but Seren was a 10 till 10 girl, we gave into her every whim, she slept in my bed for weeks on end whilst she was teething, it took us 2 1/2 years to get her to go to sleep without needing company). By the twins going down at 7 every night it meant we could dedicate time to Seren, fortunately for me Seren's first choice is reading books. Reminiscing about the boys early months makes me think how easy it was, this is made up of rose tinted spectacles. This post has been written for the Multiples and Mayhem Carnival which is being hosted Here Come the Girls.